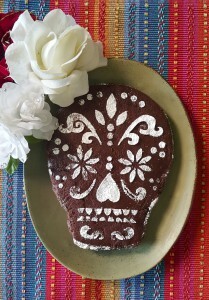 A moist sweet and spicy sugar skull cake inspired by Mexican Hot Chocolate. Sift together the flour, cocoa powder, baking soda, chipotle powder, sugar and salt. In a large measuring jug, mix together all liquid ingredients except for the vinegar. Add the vinegar and stir until even distributed throughout the batter. Bake for about 20 minutes or until a knife or toothpick come out clean when the cake is pricked. Remove cake from oven and allow to cool at least 15 minutes before transferring to a cooling rack. Melt shortening, butter and chocolate in the top of a double boiler. Add Sugar (and chipotle if using) just a couple tablespoons at a time, whisking constantly until desired consistency is reached. If it's too dry, add a splash of non-dairy milk. If it's too wet, add more powdered sugar. 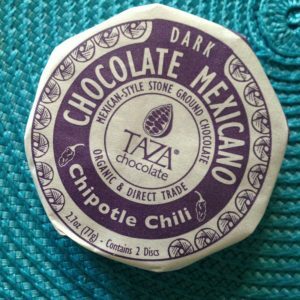 * This is the one I used, but if you can't find any, you can use either 1 disk of regular Mexican chocolate or about 1.5 oz or 40 grams of dark chocolate + 1/4 teaspoon of dry chipotle powder. ** To decorate I cut the cake into the shape of a sugar skull and used a stencil and sifted powdered sugar over it.